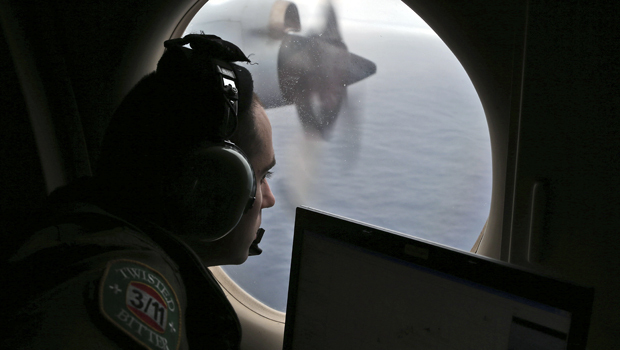 KUALA LUMPUR, Malaysia -- More planes were joining the search Sunday of a remote patch of the southern Indian Ocean in hopes of finding answers to the fate of the missing Malaysia Airlines jet, after China released a satellite image showing a large object floating in the search zone. The desolate area in the Indian Ocean is about 1,550 miles southwest of Perth, Australia, where three days of searching for similar images from another satellite that emerged earlier in the week have produced no results. The Australian Maritime Safety Authority, which is coordinating the operation from the country's western coast, said it refined the search based on the latest clue from the Chinese satellite showing an object that appeared to be 72 feet by 43 feet. It said that the object's position also fell within Saturday's search area but it had not been sighted. Sunday's search involving eight aircraft has been split into two areas within the same proximity covering 22,800 square miles. These areas have been determined by drift modelling, the AMSA said. Australian Prime Minister Tony Abbott suggested the sightings were a positive development. "Obviously we have now had a number of very credible leads and there is increasing hope - no more than hope, no more than hope - that we might be on the road to discovering what did happen to this ill-fated aircraft," Abbott told reporters in Papua New Guinea. The image was taken around noon Tuesday. The image location was about 75 miles south of where an Australian satellite viewed two objects two days earlier. The larger object was about as long as the one the Chinese satellite detected. CBS News correspondent Holly Williams reported from Perth, Australia that the Chinese government also said a smaller object roughly 40 feet in length was also seen. The Australian Maritime Safety Authority said a civil aircraft reported seeing a number of small objects in the search area, including a wooden pallet, but a New Zealand military plane diverted to the location found only clumps of seaweed. The agency said in a statement that searchers would keep trying to determine whether the objects are related to the lost plane. "CBS This Morning" contributor Michio Kaku, a physics professor at the City University of New York, said this week that the area is "quite turbulent, and even a gentle current of 5 miles an hour could carry debris of hundreds of miles across." The latest satellite image is another clue in the baffling search for Malaysia Airlines Flight 370, which dropped off air traffic control screens March 8 over the Gulf of Thailand with 239 people on board. After about a week of confusion, authorities said pings sent by the Boeing 777-200 for several hours after it disappeared indicated that the plane ended up in one of two huge arcs: a northern corridor stretching from Malaysia to Central Asia, or a southern corridor that stretches toward Antarctica. The discovery of the two objects by the Australian satellite led several countries to send planes and ships to a stretch of the Indian Ocean about 1,550 miles southwest of Australia. But three days of searching have produced nothing. One of the objects spotted in the earlier satellite imagery was described almost 80 feet in length and the other was 15 feet. The Boeing 777-200 is about 209 feet long with a wingspan of 199 feet and a fuselage about 20 feet in diameter, according to Boeing's website. In a statement on its website announcing China's find, the State Administration of Science, Technology and Industry for National Defense did not explain why it took four days to release the information. But there was a similar delay in the release of the Australian satellite images because experts needed time to examine them. Even if both satellites detected the same object, it may be unrelated to the plane. One possibility is that it could have fallen off a cargo vessel. Warren Truss, Australia's acting prime minister while Abbott is abroad, said before the new satellite data was announced that a complete search could take a long time. "It is a very remote area, but we intend to continue the search until we're absolutely satisfied that further searching would be futile - and that day is not in sight," he said. "If there's something there to be found, I'm confident that this search effort will locate it," Truss said from the base near Perth that is serving as a staging area for search aircraft. Aircraft involved in the search include two ultra-long-range commercial jets and four P3 Orions, the Australian Maritime Safety Authority said. But because the search area is a four-hour flight from land, the Orions can search for about only two hours before they must fly back. The commercial jets can stay for five hours before heading back to the base. Two merchant ships were in the area, and the HMAS Success, a navy supply ship, had also joined the search. The area where the objects were identified by the Australian authorities is marked by strong currents and rough seas, and the ocean depth varies between 3,770 feet and 23,000 feet. In addition, Malaysian Defense Minister Hishammuddin Hussein said a low-level warning had been declared for Tropical Cyclone Gillian, although that was north of Australia and closer to Indonesia. "Very strong winds and rough seas are expected there," he said. The missing plane, which had been bound for Beijing, carried 153 Chinese passengers. In the Chinese capital on Saturday, relatives of the passengers rose up in anger at the end of a brief meeting with Malaysia Airlines and Malaysian government officials. "You can't leave here! We want to know what the reality is!" they shouted in frustration over what they saw as officials' refusal to answer questions. The relatives gave reporters a statement saying they believe they have been "strung along, kept in the dark and lied to by the Malaysian government." Malaysia asked the U.S. for undersea surveillance equipment to help in the search, said Rear Adm. John Kirby, a Pentagon spokesman. Defense Secretary Chuck Hagel promised to assess the availability of the technology and its usefulness in the search, Kirby said. The Pentagon says it has spent $2.5 million to operate ships and aircraft in the search and has budgeted another $1.5 million for the efforts.